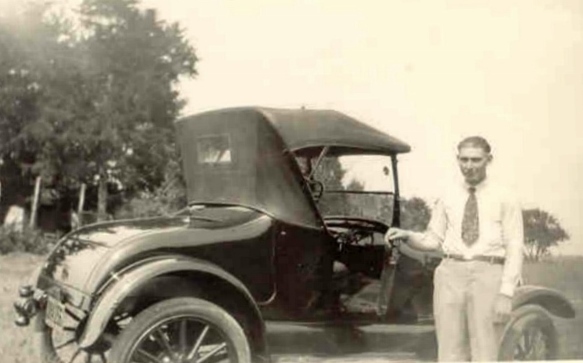 In the discussion of the gap between the hood and the shelves on a 1926 Tudor, Bill Harper summed up Ford quality control very nicely: "Can the hood be closed? Yes. Then it's fine, out the door with it." A bit of exaggeration, perhaps, but not by much. Think of the Rip Van Winkle 1917 touring with its paint drips and not-quite-fitting upholstery. I think we tend to forget the frantic pace at which these cars were produced. 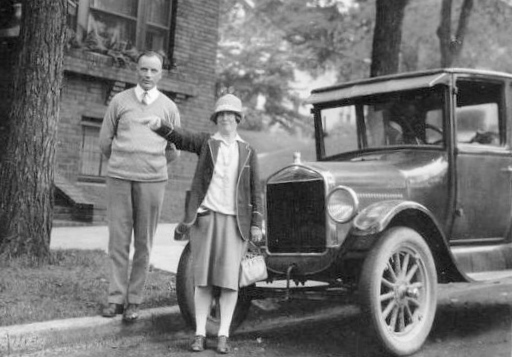 By September of 1924 Ford was making over 7000 vehicles a day. If I pushed the right calculator buttons, that works out to another new T rolling off the line every twelve seconds. We may spend months or years resurrecting an old derelict, enjoying the luxury of time to make it pretty, but those guys rushing them out the door ninety years ago had to get it together fast, fast, fast. It's amazing they were as good as they were. A little off center? Close enough. Get it out the door. Yes, and they didn't use any of those diabolical plastic "push to fasten" fasteners like modern cars - 90% of them break when you try to remove them and have to be replaced. A friend of mine meet a Ford assembly line worker that put some of the early Mustangs together. He had conveyed on things like how long they were allowed to put two fenders on the car. It was rather ridiculous sounding for someone like me, but as was said above, is it on the car--good enough, and out the door it goes. I think we tend to over restore vehicles and seek that perfect fit, if nothing else because we have the time to. I am just as guilty of it as is the next guy. I like to make things better than new if possible, to me it is pride in my workmanship--and that takes time. In another posting of Steve Jeff's , it made me think of the paint jobs Ford put on his cars. After consulting the MTFCA encyclopedia about the type of paints that were used during the building of T's there is a line that says the Ford engineers considering changing up the paint formulas to speed up production. The idea was to make the paint dry faster! Every second counted in putting T's together and Ford would do whatever it took to 'get them out the door'. Would that be 7000 cars per day from all his plants combined or just one assembly line? Perfection is the enemy of Good Enough and Good Enough ... isn't. In another thread, someone said the cars weren't that shiny when they were new. Then, someone else posted photos of some really nice shiny new cars. I don't remember if it was that same thread or not, but someone mentioned they didn't stay shiny for long. I have no way of knowing, but that was always my understanding, too. I also have to wonder if they didn't do an extra special good job on the ones for promotional photographs. It would make sense. I work for a company (Second time around) that builds industrial machinery. For trade shows, it is not uncommon for us to have automotive quality paint applied by a professional body shop. On our everyday run of the mill machinery, it gets shot by one our employees with lesser quality paint bought in bulk. I wouldn't be surprised if Henry made an extra effort on the ones for those pics. Think that many times the Ford did stay shiny. Just depended on the owner's maintenance. Today its the same, some cars look bad in a few years. Think too that Ford constantly improved the finish on the cars, esp. the later ones, using newest materials and methods. But the Ford baked on gloss enamel paint would look good for years if the owner wanted to do the chore. Guess most of them got work over play, and worn out that paint along with chassis and body parts too......it was after all the cheapest car out there! ...now head out to the garage and wash and wax those T's!! Even a new car would be hard to keep shiny if you lived on a dirt road. My T is very shiny when cleaned up, but my favorite roads are gravel, so it's usually covered in a layer of dust. As for taking the time to perfect the fit of the panels, it's often an important step to keep parts from rubbing the paint off each other. 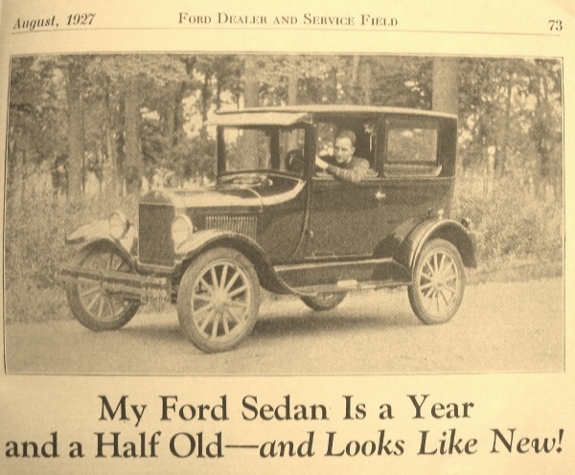 Fords produced during the black years didn't get the paint oven baked on parts with wood in it, like the body, so I guess body paint faded faster than the all steel oven baked parts like fenders and hoods. There have been original photos posted at the forum of cars that had been used for a couple of seasons where the difference in paint gloss could be seen. Showing shinny 26/27 is like comparing apples and oranges or even say 4 doors. The bodies for the 26-27 open cars, tudors and coups could be painted and oven dried before the top and little bit of trim holding wood was put in, the 4 door (Briggs?) was made by outside company. The earlier cars were painted after the wood was installed so different paint/varnish was used and had to air dry. That in itself makes a differences in how long the body would/could stay shinny. The parts that could be oven dried stayed shinny long after the body on the earlier cars faded. I am afraid to wash and wax my T. I do carefully wash it occasionally. But Wax? I may have to touch up the paint with a spray can and wax makes that difficult. The Ford paint work for most of its manufacture was similar to todays paints in the way it was applied. After prime surfacer treatment the blue/black color was applied, it dried flat. Leaving out any gloss resin meant the paint covered better. The final coat was a clear varnish of which many varieties were used over the years. They initially resulted in a very glossy finish but depending on the conditions whey were exposed to such as heat and sunlight and maintanance they lasted only a short time. In the late 1920's baking enamels which are superior as their resin base is designed to dry at several hundred degrees helped a lot but they are more expensive to use so often cheaper paint formulas are used. In Australia virtually all British cars up until 30 years needed to be resprayed when landed before being sold ( even Rolls Royce) because the paint used worked well in their cooler less sun weather. its only about 20 years since they became really good when UV inhibitors were added which meant the paint could outlast the cars useful life. 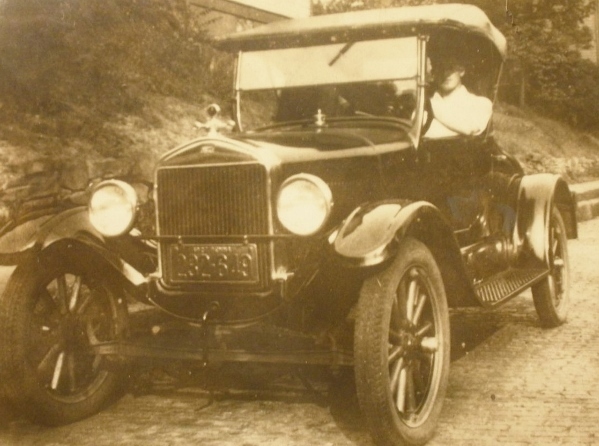 Unfortunately in its day the Model T was treated as just a machine to do a job. Few took really good care of them and conditions were bad (poor roads etc) You see lots of photo's with people sitting or standing on the hood and guards and the car dramatically overloaded, so much so we often wince thinking the car would be damaged badly by such action. Nice paint finish required lots of care and money to upkeep so most of the time only very expensive cars got that treatment. Dan , I like the second photo of the old boy standing next to his 26 standard runabout with non demountable 30x3.5, with no spare tire mount and kerosene tail lamp. Interesting . I wish the proud owner would step back so we could see more detail on this standard. Also noticed that the '26 Standard runabout does not have top saddles, just the rubber plug in the side of the body. You can still lower the top, but it would just rest, and bang, on the turtle deck. 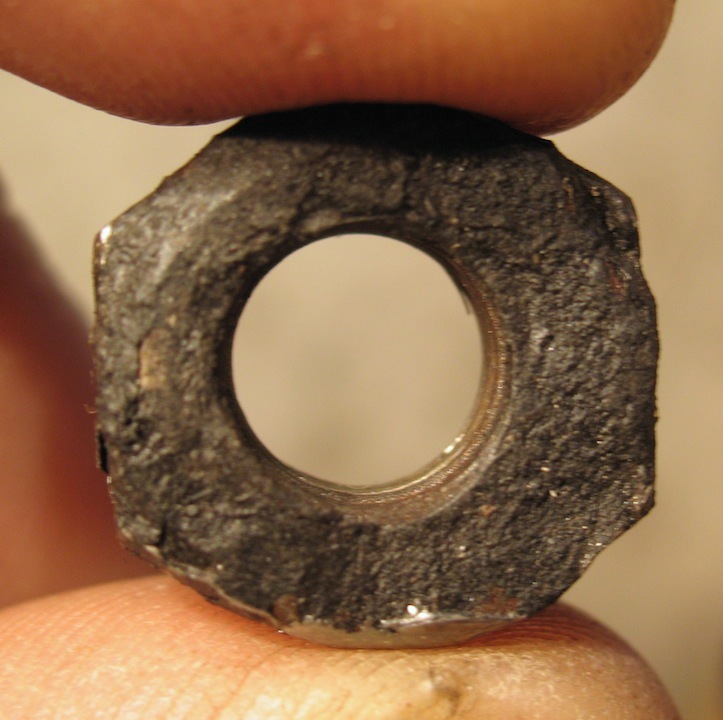 You can remove the rubber plugs and screw in the top saddles which were probably in the trunk or under the seat. When you put the top back up, you could unscrew the top saddles and re-install the rubber plugs but probably nobody ever did that and they just left the top saddles installed. I have never waxed my T's since I painted them. One I have was painted 20 years ago another was painted in the 1960's and the other painted about 2000. I use the wash and wax solution which you put about 1/4 cup in a pail of water. I use a sponge to put it on and a towel to wipe it off. I don't use a hose on the cars. I use it under the car and also on the wheels. I use on top too. The cars are garaged and only go outside for tours, parades, and shows. They all shine like the day they were painted. It has been my understanding (could be wrong, willing to be corrected) that the Standard cars, with their non-demountable wheels, kero taillamp, and starter-generator delete, were not equipped with top saddles and the arms. My Canadian '26 touring has starter, generator, and electric tail lamp but had no top saddles, just the rubber plugs. AFAIK the car is equipped pretty much as it came from the factory.